Just like the seasons,the makeup trends come and go and some stay with us and some we like to keep so close to our heart always! I was meaning to try it and when i went and tried, i couldn't decide which one to pick as so many shades looked so good..i will definitely go and buy one more shade in this!! 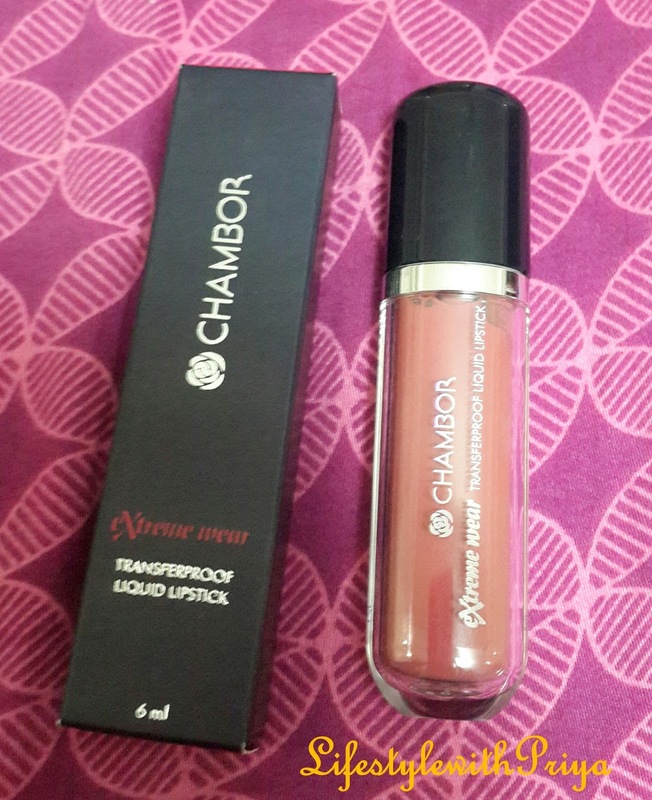 It retails for Rs845 for 6ml. It comes with a doe foot applicator as shown in the pic below. 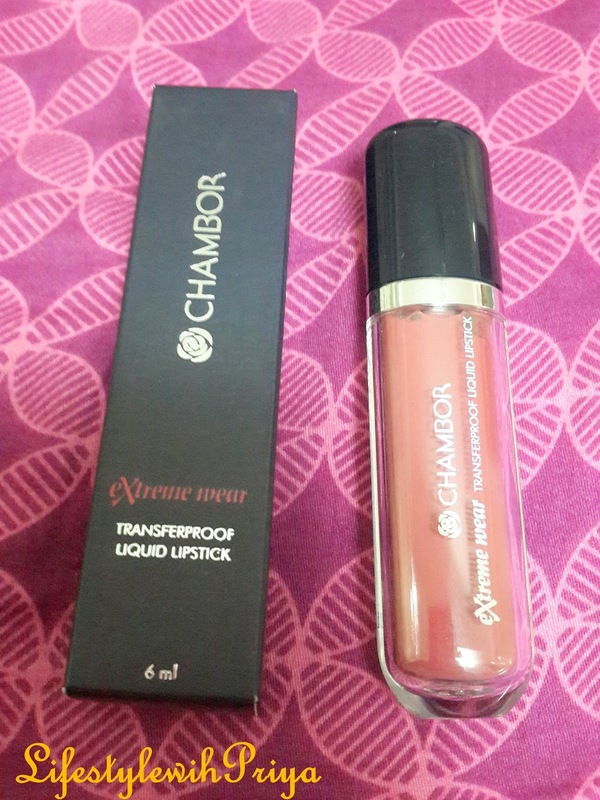 The best thing i like about this lipstick is that is Transferproof once it sets on your lips. They last for about 6-8 hours,after which you can reapply if you wish. 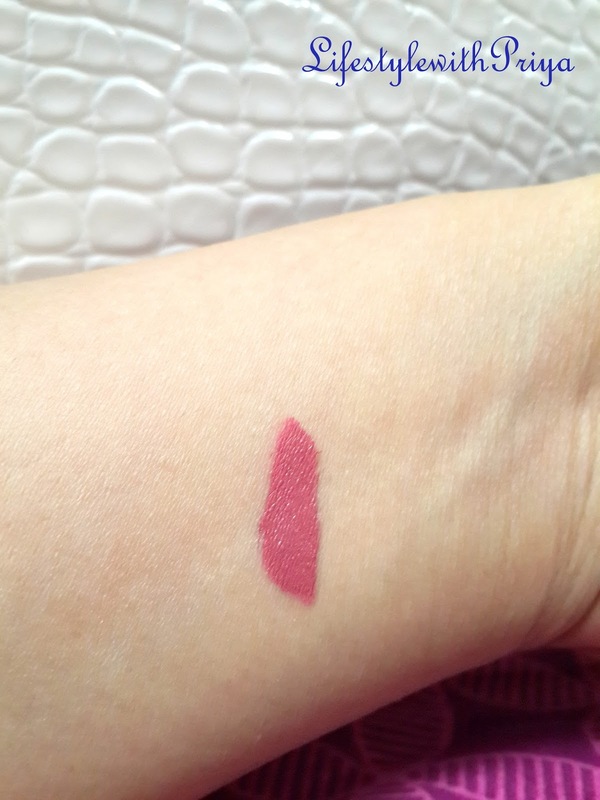 This swatch is only with one swipe but you can easily layer it before it sets,As once it sets on you can't layer it as it becomes matte.But Chambor claims that it is very pigmented in one stroke which is absolutely true as its very opaque after 1 swipe so you don't need to layer it unless you really wish too! 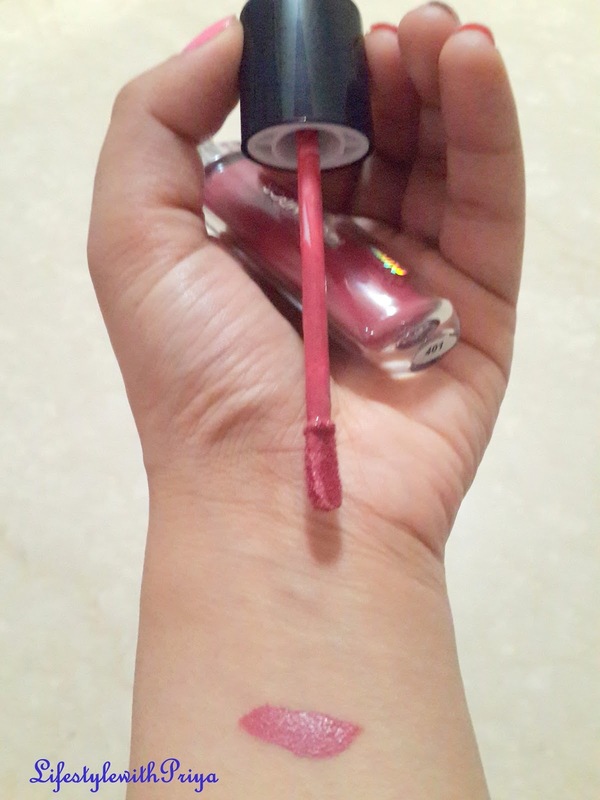 You can check out the Pros & Cons and see if it is something you are looking for..
Can't reapply on already dry lipstick on lips else it can become crusty when it sets so layer 2 coats only when u are applying fresh. But I have been lately obsessed by this and this formula is a must have for all you lipstick lovers like me! If you liked my review make sure to join my Blog by signing up with your Gmail ids by cliking on "JOIN THIS SITE" Button on the top right corner and do join my Social Media (links on the Top right corner of the blog with their respective icons) for all the updates of posts and other fun stuff as i post much more frequently there! 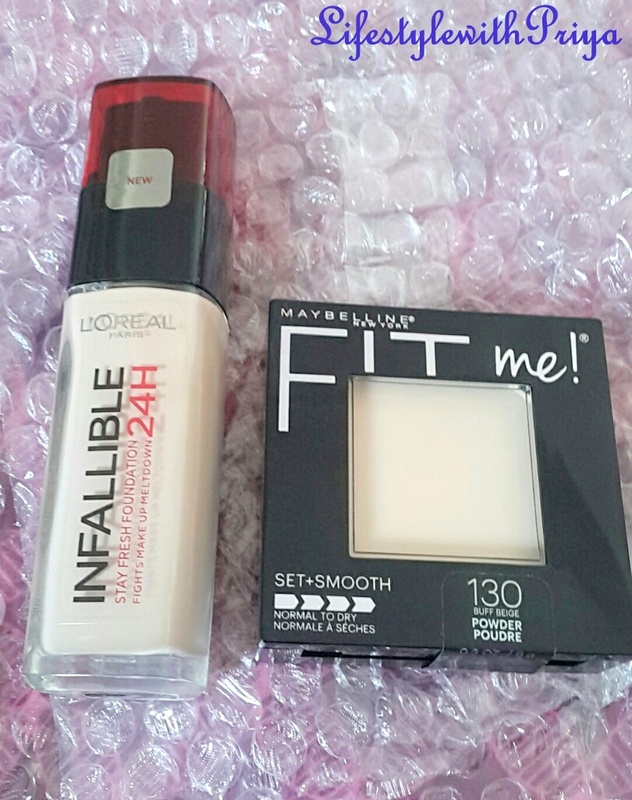 So with my Post title you can figure out what am i about to Review, but just hold on..This is not just any product that i would be reviewing..Its a makeup Must have for all you beauties..even if you don't wear foundation on a Daily basis, save it for those special occasions,events or festivals etc. This foundation does just that...so effective till the last bit,not wearing off even in hot Delhi summers!! It comes in a Glass bottle with a RED cap and a Pump dispenser which i absolutely love, because its fuss free, and no product wastage! It costs Rs 1325 for 30 ml but its totally worth it given what this foundation can do to you and you can always look for discounts online! 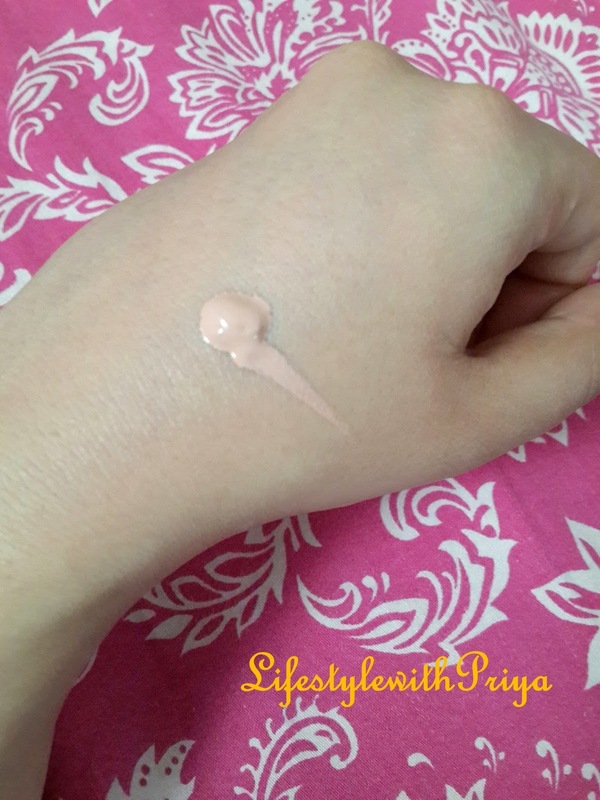 i had initially heard from some Youtubers that it oxidises in heat but so far it has never oxidised on me! They even have rosy toned shades and yellow toned, based on your complexion! It claims to have a stay power of 24 HRS but when a product claims to have stay power of certain hours then half of it is true..I haven't tried it for 12 hours but ya it has lasted more than 8hrs on me for sure! It has a soft creamy consistency, and it has full coverage for any sort of uneveness or blemishes on your skin.It claims to give a matte finish which it does, so perfect for oily to combination skin beauties! It gives a demi-matte look not complete matte which is great as you don't look cakey with it.It blends like a dream! You can also layer this double depending on the coverage you want, but even single pump gives great coverage. Very Easy to Use with just a pump dispenser! Glass bottle can be risky to travel with so you have to wrap well while travelling with it. You have to blend it fast before it dries on your face while dotting up across your face! 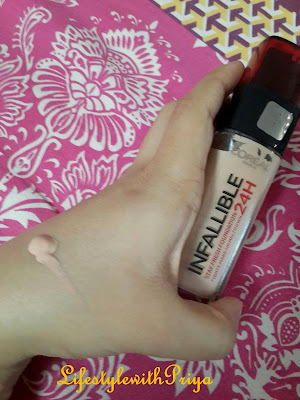 But to be Honest,it does not really have many Cons..I really love this foundation & would recommend to all you girls, whether you are in college or to use in office or for events. Do go and purchase and feel the awesomeness it offers!! If you liked my review, then don't forget to Signup on the Blog on the Top right of the page! Please do share this with all your girlfriends so that they can benefit too. Links are again on top right corner of the Blog. Wish you all a very Happy Navaratras! So you would want to prep your hair with the right products so that they look good all the time. I have lot of people asking about my haircare routine or haircare range of products that i use for my long hair. 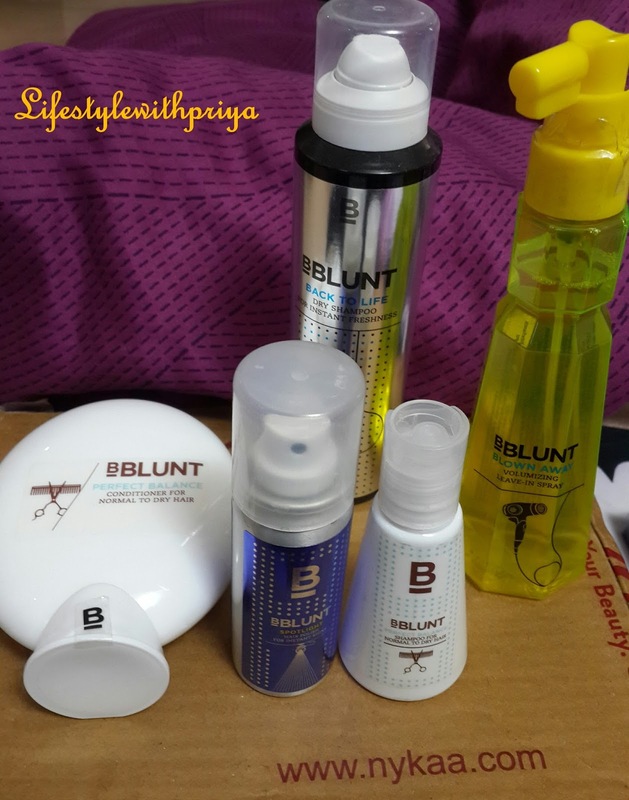 So i had ordered all these products in intervals of months.. like some i have been using since a long time and some of them i recently got.I have been using the Bblunt Dry shampoo and the Spotlight shine spray , BBlunt Blown away Voluminising leave in spray,since a while the Bblunt shampoo and conditioner i have been using since about 15days. Lets begin with the Review.. 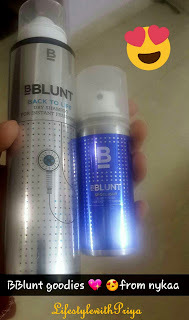 I have been using both the sizes of this product..There is the full size which comes for Rs 550 for 125 ml and the Mini size which comes for Rs 250 for 30 ml. I got the big one for daily use and mini one just to keep it in my handbag or for travel purposes! If you dont knw what a Dry shampoo is, then in short it is your saviour for the days you dont want to shampoo and still look put together or you dont want your hair to look greasy! You just Spray a lil bit of this on your scalp where you feel you need a bit of lift and it is going to add a bit of lift and awesomeness. Don't mistake it with an actual shampoo the feeling you get after a wash but yes it does make your hair feel so great..remove any greasiness and adds volume on the scalp..just what you need before heading out! It is for 2nd or 3rd day hair..you will have 2 wash your hair the next day!! 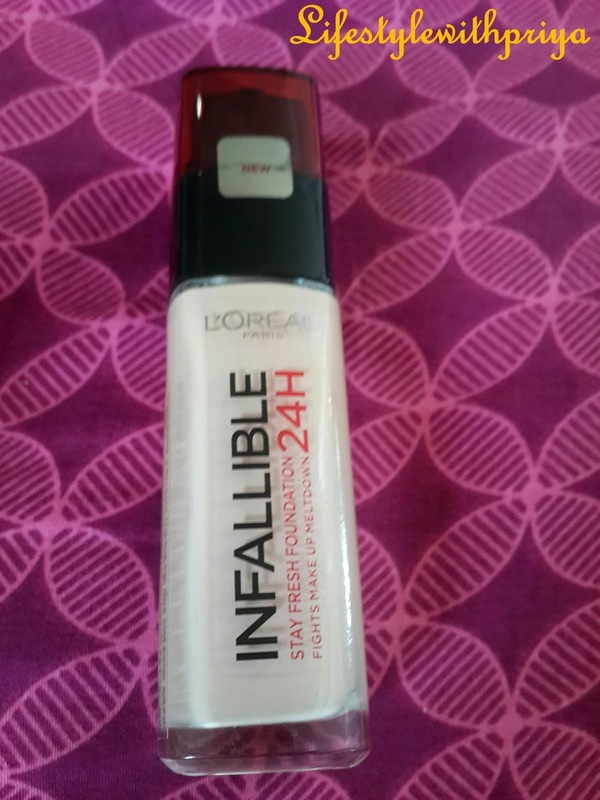 I just love it to bits as its the most inexpensive Dryshampoo and a part of my vanity ever since i used! This i got a month back and have been started using recently as i wanted to try out this range. Just by seeing its packing, don't you feel like ordering. Yes i couldn't resist and so much more coz of the type the shampoo it is..for "Perfect Balance"! So when i read the ingredients that it has Provitamin B5 and glycerin which is good to lock the moisture in your hair i really wanted to try it. 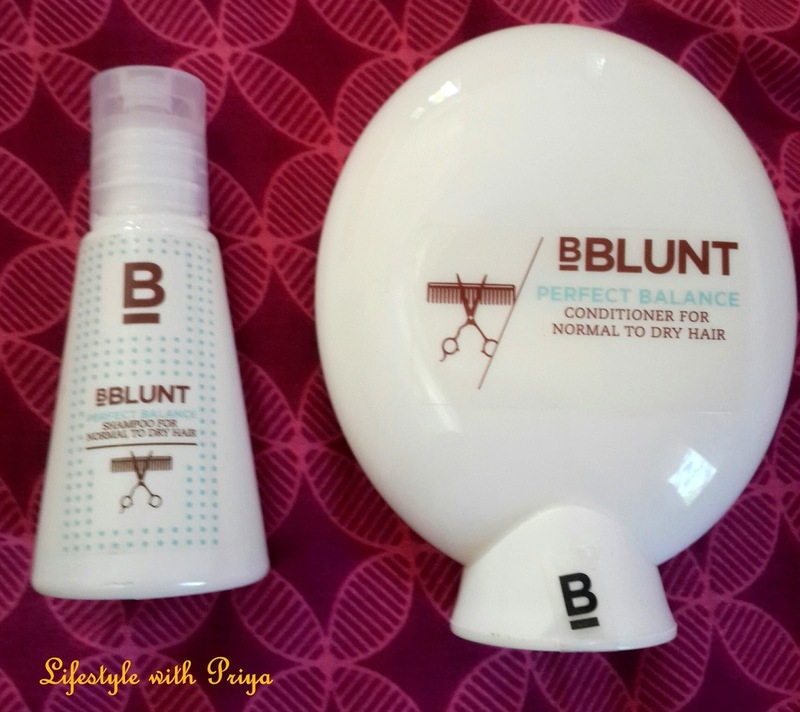 its perfect formula gives a pick me up for your hair with providing a moisture balance and your hair appear clean and healthy! I did feel that it is quite a good shampoo..as it throughly cleanses without drying, Also its white in color with a creamy consistency which makes your hair soft. I got the mini one for Rs100 for 50ml and the bigger one is for Rs 550 for 400ml. The conditioner's packaging is sooo cute. both of them are very travel friendly. The conditioner retails for Rs375 for 200gms. Both the shampoo and conditioner are for Normal-dry hair! The consistency of the conditioner is thick but not sticky as all..It does make your hair soft but it is not going to make damaged hair extremely soft. Since i don't have damaged hair it works perfectly for mine, if you however have damaged hair then go for the other ranges of BBlunt as they come in many variants. 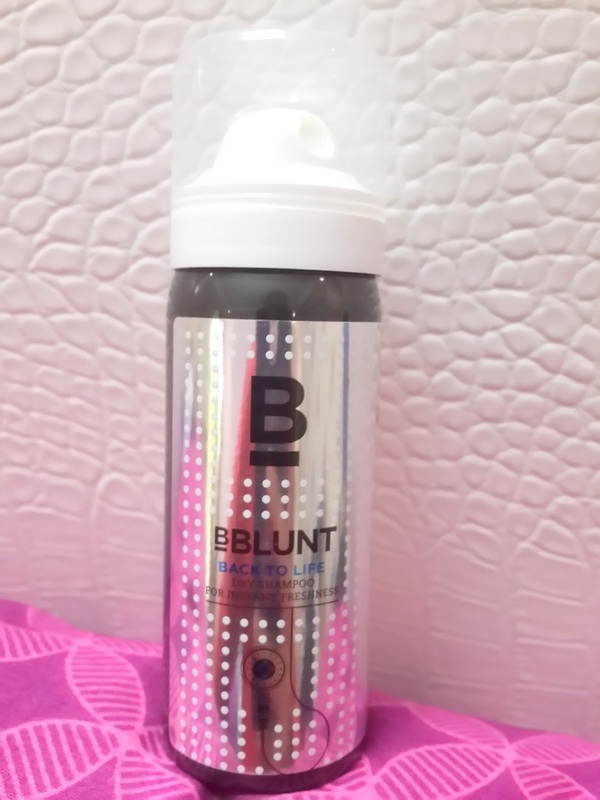 This spray is to be used on damp hair to add volume to your hair,also like a heat protectant before you Blow dry your hair. I have been loving it so much that i ordered my 2nd bottle of it. It adds a slight volume on your roots and also acts as a heat protectant. Its for Rs 550 for 150 ml. It acts like serum but with a spray so it is fuss free and travel friendly! It does not add Spotlight shine as mentioned but it does add a smoothening texture on dry or frizzy tresses. The best thing i like about it is that this spray does not make your hair hard like other sprays do! It also comes in bigger size for Rs 550 for 150ml. If you liked my post then dont forget to join me on my blog by signing up with your gmail id on the top right corner of the blog. You can also follow me on all my social media listed below the follow me tab on top right corner. 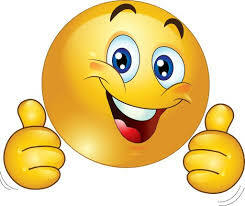 Don't forget to like the page or the post and share with friends so that they all can benefit from it.